The coming of a new year is an opportunity to set new goals, make new year’s resolutions, and approach new tasks with vigor and enthusiasm. I know for some, it might mean getting back on track with an exercise program or starting that book that has seen more procrastination than pages completed. But right now I’m most interested in how various patient communities collectively approach the new year. Are goals and resolutions actively discussed? If so, are these new year’s goals collaborative or individual? How do these discussions occur in various communities? Are there any trends that can be observed by looking at the collective patient community conversation on Twitter? How have these goals changed over the years? These are the questions I tried to answer – and thanks to the data provided by Signals, I have some fun data to share with you all. The hashtags I included in my search were: #bcsm, #btsm, #dsma, #hcldr, #hcsm, #hcsmca, #hpm, #lcsm, #medpsych. 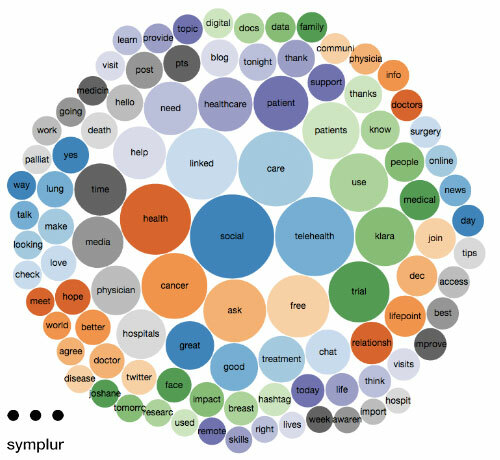 No, this is not the entire list of tweetchat communities – as of this post, Symplur is currently tracking 154 recurring tweetchats – but I felt this would give me enough to start a conversation. Through Signals, I created a content filter that focused on the tweets I care most about, in this case the tweets that include the word “resolution” or “goal”, for further analysis. As is the case with any research, there are a couple of caveats with the data I’m presenting. First, participants may respond to prompt about “goals” without specifically using the word. So while the intent of their tweet should be included in the “goals” bucket, content identification in this instance is binary, if the word isn’t included, the tweet is not included. Second, any tweets using “goal” or “resolution” with one of the featured hashtags outside of the tweetchat window is included in the data presented. Looking at the specific tweetchat windows is easily possible, but for the sake of this post, that would be discrediting the community building effort that results in a hashtag being more than a 60-minute identifier. Summary of “Goal”-related tweets from December 1 – January 20. 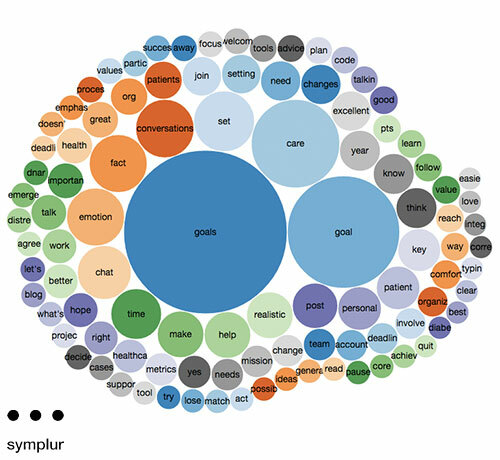 The word bubble charts below show how the conversation is changed when viewed with tunnel vision on “goals” and “resolutions”. Word bubble for all tweetchats from December 1 through January 20. Word Bubble for all tweetchats, filtered for “Goal”-related content from December 1 through January 20. Finally, here are the number of times hashtags were used during this reporting window. 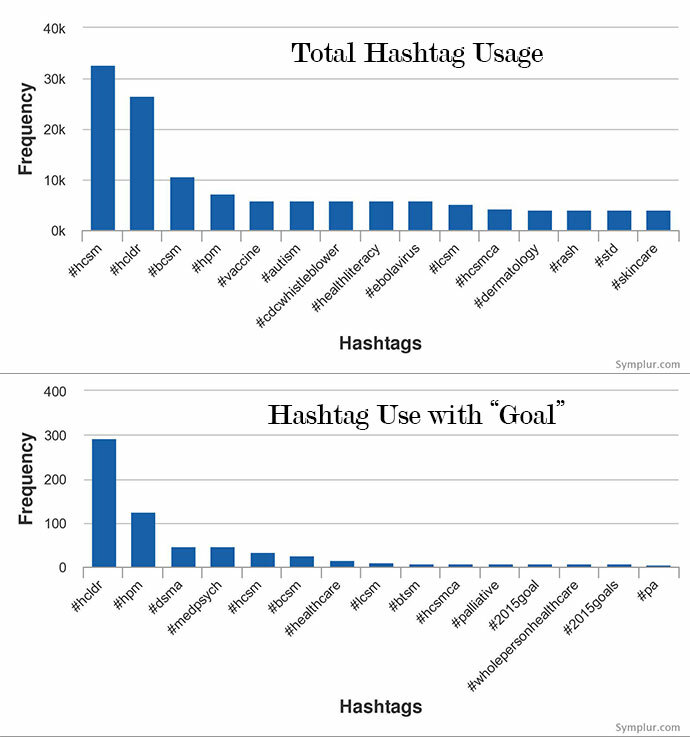 Hashtag usage, Total and filtered for “Goal”-related content from December 1 through January 20. 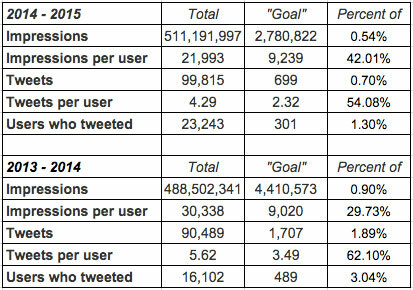 Of note, #hcsm usage is tremendous (so much so, that I may dig into this next month), and the #hcldr community is quite enthusiastic on sharing their new year’s goals for 2015. #hcldr approached goal setting with the idea that small steps can make a big difference. #hcsm took a more universal approach to looking forward to the new year. #bcsm featured an “open mic” format for their first 2015 chat to go along with this blog post: www.bcsmcommunity.org/happy-2015/. The opening topic for #dsma in 2015 was “kicking off the new year”, but not all of the questions focused specifically on diabetes. Do you find free-flowing conversations or rigid, timed topic introductions to be the most effective in generating a conversation among your community? Do you think blog posts before or after the chat to be the most effective in growing the community conversation? Does the frequency of these chats impact the topic delivery method? What tips would you offer to someone looking to start a brand new tweetchat within their community? For the data junkies, this Dropbox folder contains all of the raw data referenced through Signals-generated .csv exports.